3) Disabled Camping (Blue Badge holders). Are charged per person and include free vehicle parking. Under 16’s are FREE but tickets are limited to 2 per Adult ticket order and must be booked when ordering Adult tickets. Disabled Camping Section tickets are for Blue Badge holders only. A Permit for all live-in vehicles used for camping must be pre-booked when ordering camping tickets. There is a small £10 surcharge to reserve your camping pitch and limited numbers available. You may bring food and drink on the camp site when you arrive, for personal consumption in the camp site only. When entering the music entertainment area, a small food picnic in a bag or holdall is allowed (no rucksacks or large cool boxes, for safety and security reasons), plus one 500ml plastic, sealed and previously unopened bottle of soft drink or water per person is permitted. However, your own alcohol may not be consumed in the designated entertainment area due to licensing restrictions. NO GLASS or metal utensils are allowed on site due to Health & Safety restrictions. Open fires directly on the ground are not allowed on the site due to safety reasons. Barbeques in purpose-built metal containers (no bigger than 18 inches diameter) with legs, so they are raised off the ground, can be used, but must be attended at all times when lit. 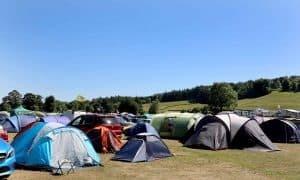 If you have camping tickets and would like to camp near to friends, please try to ensure you enter the site all together, as camping plots will be filled up sequentially. There is no designated meeting area inside the site, so if you want to camp together, simply advise the marshals and, where possible, they’ll organise to reserve the camping space next to you, to be kept for your mates, for when they arrive. 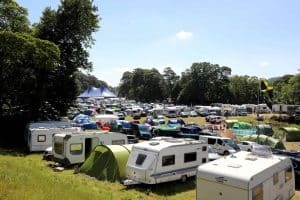 Please note, live-in vehicles such as campers, caravans, motorhomes, etc, will not be able to pitch up in the Tents section for safety reasons. The Disabled Camping section is located closest to the music entertainment area for ease of access, and is for Blue Badge holders only. 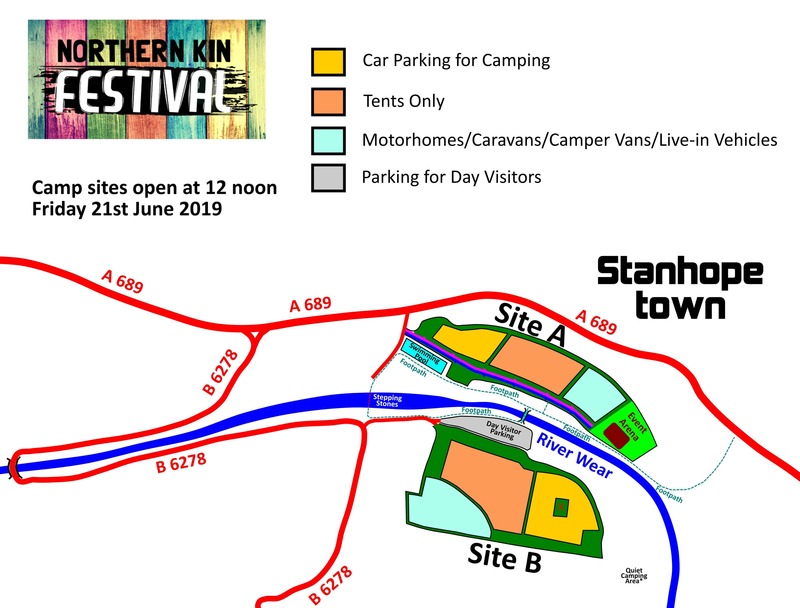 If you have any other specific camping requirements or queries, please email us at info@northernkinfestival.co.uk or via our Contact page and we will do everything we can to help you. Also note that camping tickets will not be available on the gate - camping is pre-sale only. As always, camping and day tickets will be strictly limited on a first come first served basis and the ticket prices have remained the same. The team who run Northern Kin really care about the festival and can promise you fantastic live music, a great, friendly, festival atmosphere, and a brilliant weekend that everyone can afford. We're really proud of Northern Kin and we know you love it too. Don’t miss it and we’ll see you there!